LONDON, 28th June 2018: American global audio specialist, Mixcder, is today pleased to announce the availability of the E8, which feature the company’s latest advancements in ANC technology to deliver superior noise-cancelling performance and audio quality, along with improved wireless convenience. The new sleek, all black design of the E8 and premium, soft foam pads are designed to combine style with exceptional comfort to be the perfect accessory for travellers and commuters. The hybrid active noise cancellation also means they will no longer be disturbed by any external sounds. 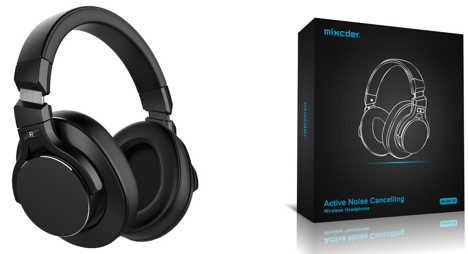 The Mixcder E8 headphones are available in the UK for £59.99 from Amazon . The Mixcder E8 Bluetooth headphone is built with a hybrid ANC technology, which uses a recently developed active noise cancellation system that works in a wider frequency range in the low to midrange frequencies than most ANC designs, and provides an improved degree of noise cancellation. It also delivers improved isolation for better noise cancellation outside the active range. When an incoming noise is detected by the headphones, a digital signal processor (DSP) analyses the sound waves and creates inverse waves to cancel out the ambient sound. Simple to activate, users simply switch on the ANC button on the left ear cup to shut out from the world and relax with their music or film without being disrupted by noisy neighbours on a train or plane. The E8 is equipped with 40mm drivers for a powerful, wideband frequency response from 20Hz-20,000Hz with impactful bass, a rich and detailed midrange and clear, extended treble. The CSR Bluetooth and drivers balance sound perfectly, especially in low frequency offering a crisp sound, at up to 102 decibels. It delivers real clarity of sound, particularly with low frequency sound with a deep bass which is powerful and punchy. E8 Listeners are able to immerse themselves in their music or film with no disruption from external noise and enjoy every nuance of their favourite song. The E8 features buttons and a microphone allowing for wireless control of music and hands-free phone calls. The large-circumference ear cups are made of aluminium, which make the sound easier to rebound and provides a premium, high end look. Using super comfortable and soft pseudo leather to cover the memory-foam padding in the ear cups make these comfortable to wear for long periods of time and the rotatable, extendable arm offers that flexibility needed. The ear cups fold down flat for easy packing and t he robust and durable carry case included ensures the E8’s are secure at all times for travellers on the go. The Mixcder E8 has a battery life of around 18 hours which proves plenty of time for users to play music or make phone calls whilst on the go. When the battery is low, users can continue to listen to music with ANC for 40 hours in total by plugging in the included 3.5mm audio cable to connect the headphone to their smartphone or MP3 player. If not using ANC, the device will function as a normal wired headphone – ideal for those who often forget to charge their headphones! The Mixcder E8 Active Noise Cancelling Wireless Bluetooth Headphones are available for £59.99 from Amazon . Originating from America, Mixcder is a modern audio brand that integrates both technology and art into its products. Mixcder’s products range from earphones and loudspeaker boxes to various audio accessories. Mixcder’s products are specially designed for modern and fashionable young people and music enthusiasts. The product design is full of vigour and vitality and represents the youth’s beliefs of pursuing their dreams, enjoying life and moving forward. Mixcder’s brand culture is characterised by the lifestyle: “Join and enjoy. Join together and enjoy together”. Full of magic, music, with its beautiful melody and rhythm, can boost our mood, intensify our taste and make us feel the beauty of life. Mixcder is continuously striving for excellence and innovation by creating audio products that aim to restore the essence of music, fill people with vitality, and the world with sunshine. Previous ArticleWhat will future businesses look like with advanced workplace technology?